Get the shower of your dreams today! The Shower of Your Dreams. The Linear™ Sliding Shower Door system is an affordable way to bring the beauty and performance of a high-quality shower door to your home. For those who prefer the look of more substantial hardware, the Linear™ shower door provides the luxury and beauty of a more traditional framed shower door. 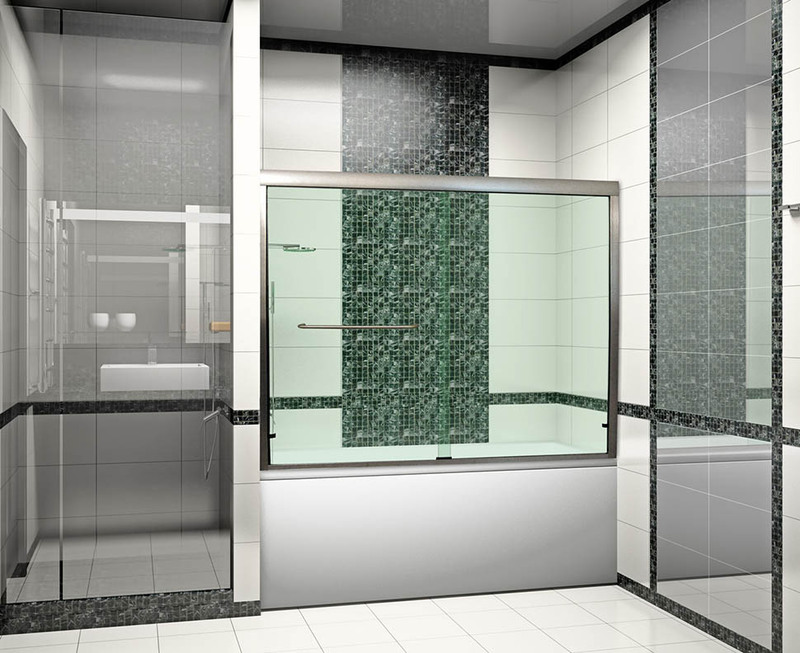 Linear™ showers use a sleek, modern looking top frame. The stable hardware system ensures that your shower won't sag and will glide quietly and smoothly for many years. Premium, 3/8" tempered glass is durable and safe. It gives your Linear™ shower a substantial feel, and the glass stays firmly in place thanks to the top-of-the-line, stainless steel hangers and heavy gauge aluminum that comes with your new shower. Other shower doors (like those that you can purchase at a big box retailer) cannot match the construction of a Linear™ shower, as their hardware is made from thin aluminum and often held together with glue. You'll find none of that at Dulles Glass & Mirror. From the initial quote to the measurements to the final installation you'll find that the installation process is simple and worry-free. The Linear™ sliding shower doors are easy to clean with a simple squeegee and glass cleaners. 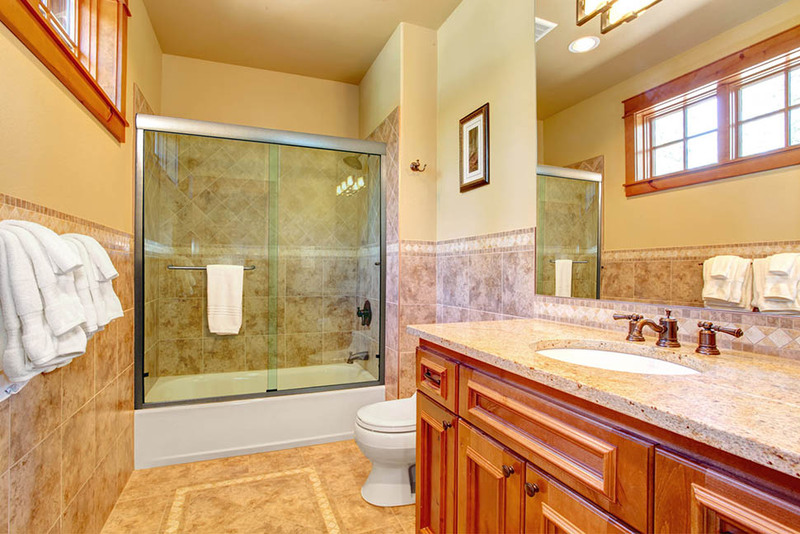 Unlike the old frameless showers, there's no bottom track to collect mold and soap scum. We recommend that you treat your new shower door with ClearShield glass protectant, which is proven to keep the glass cleaner and free of build-up over time. Because we're a full-service glass company, we offer a full range of custom options including configuration, glass thickness, and hardware finishes. Each shower is made to order, not mass-produced in a factory somewhere far away. This easy, affordable upgrade is not only a pleasure for you to use and enjoy, but for prospective home-buyers as well. 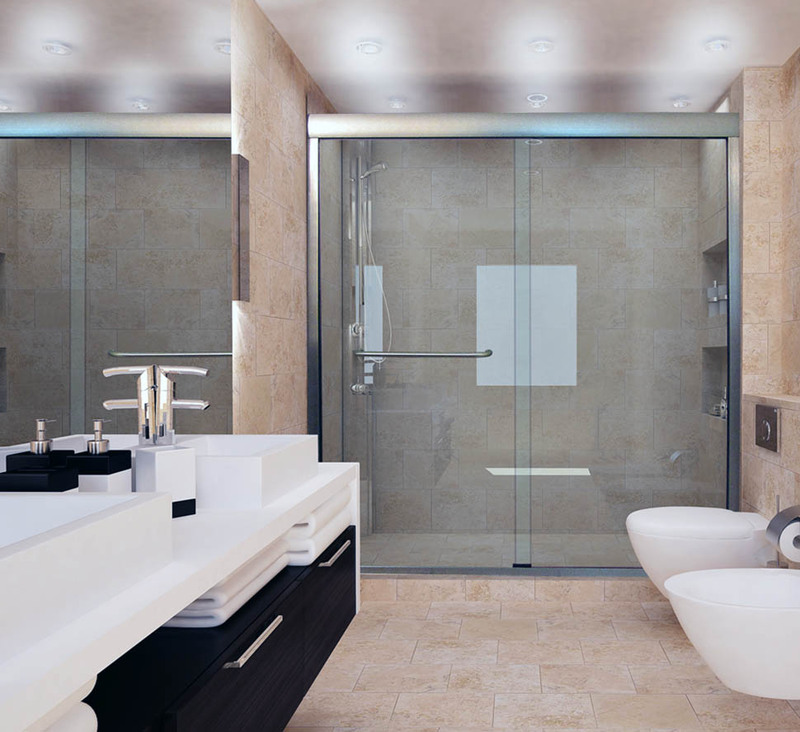 The clean, contemporary look of a Linear™ shower can be the focal point of your bathroom. Heavy frames and rattling tracks are out – streamlined, quiet beauty is in! You can be confident that our warranty is one of the best in the business. 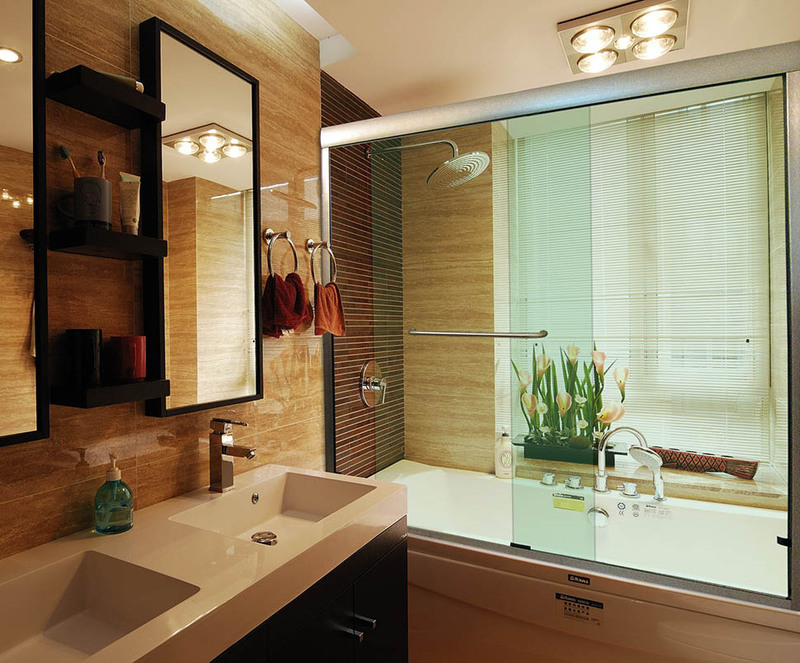 For three years, your entire shower is completely covered by Dulles Glass & Mirror. The Linear™ shower comes with a premium header bar made of heavy gauge aluminum, which holds the weight of the glass doors (typically 160-180 lbs. total). Stainless steel sliding hangers are concealed inside the header, with rollers for smooth sliding. The hanger is installed through the glass, not glued. Using glue on a shower often fails, sags, or comes off the track. The high-quality bottom track is designed with a 1/4" slope so that water runs down and towards your shower drain. This keeps water from collecting on the bottom track where mold could form without the slope. 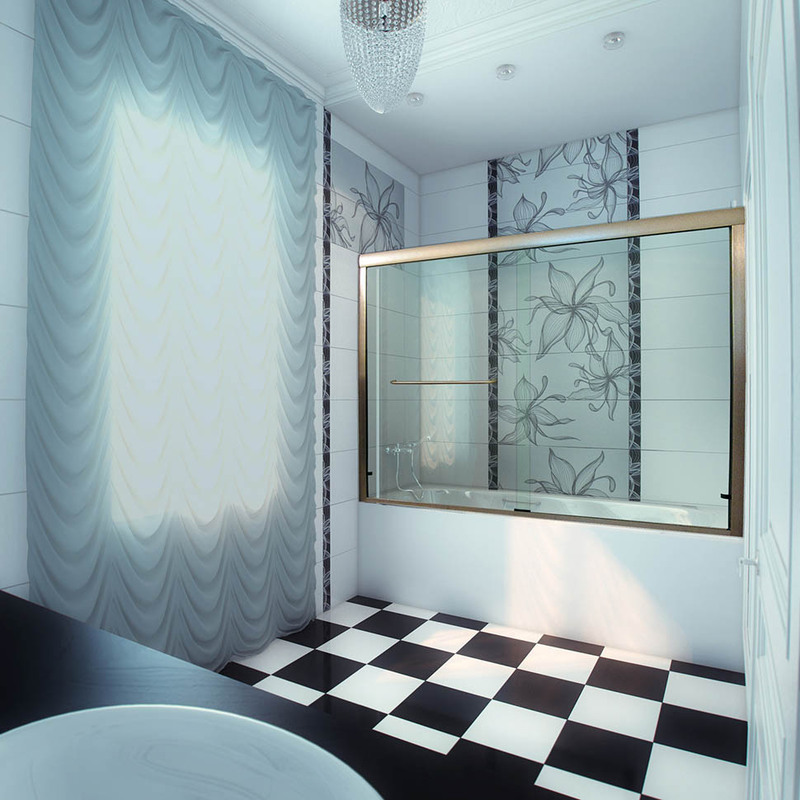 Side metal bars are optional on a Linear™ sliding shower. You can opt for a clear plastic side bar (also known as an l-bracket) which work as a bumper instead of metal. Choose from a variety of handles and knobs to suit your style. They're installed through the glass, not glued on, so you can be confident in their durability over time. Bypass doors slide both directions for added convenience and functionality. We use two hangers per glass door for added smoothness and no vibration or friction. Imagine the transformation! Just a few simple steps and luxury is within reach. Your new shower price will start at $1199 for a Linear™ sliding shower door up to 72" tall and 72" wide; standard 3/8" glass; and chrome, or brushed nickel hardware finish. Additional upgrades are available upon request and include the following for $99/each: upgraded glass type; increase height to 80"; add a towel bar/combo handle; upgraded hardware finish to oil rubbed bronze; ClearShield glass protector. For a corner or 90 degree configuration, please call 1-866-452-7707 for a quote.